The Facebook Share button is a simple and convenient way for people to display content posted by other Facebook users on their social media walls. When someone hits the Facebook Share button, they can publish a post that they’re interested in on their own wall, without having to copy and paste a link onto their Facebook profile. 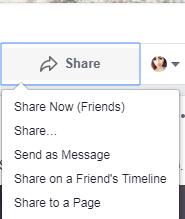 The Share button is one of the three engagement options that Facebook gives users to allow them to connect with people online. The other two options are “Like” which gives users a way to show how they feel about a post with an Emoji reaction, and Comment. What happens when you use the Facebook Share button? You can choose to share content immediately with your friends, send a post as a message or share a post on a specific Page or Timeline. Alternatively, if you add a Facebook button to your website to encourage word-of-mouth marketing and engage your target audience, clicking the button will only allow users to share content on their profile page. Along with a link to the page that your user chose to share, they’ll also be able to add a comment or tag any relevant followers. Why does the Facebook Share matter to brands? A Facebook Share is essential for businesses because it’s a lucrative form of engagement. When someone chooses to “share” your content, they’re contributing to your marketing campaign by improving your brand reach and displaying your material to people outside of your existing social network. A Facebook Share may be the most valuable form of engagement on Facebook, particularly if it’s combined with a comment that you can evaluate to see why your user enjoyed your post. To create a Facebook Share button for your site, go to the Facebook Share page and create a code. This code needs to be placed on the backend of your website. 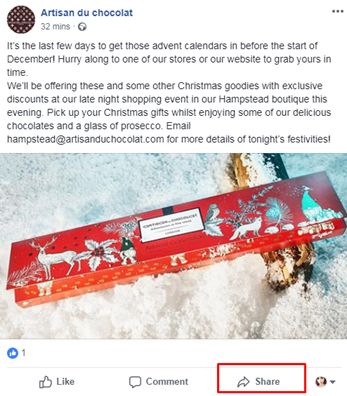 Brands will be able to choose if they want to include the share counter (how many people have shared the post) as part of the button. Remember, the most important thing to do when using either a Facebook Share button or encouraging them on your profile, is to measure and track your results. With a tool like Sprout Social, you can see how many Shares each of your posts are getting and determine what kind of content delivers the most engagement for your brand. Facebook Shares will highlight the content strategy that is most likely to lead to conversions for your brand, as people who engage are also more likely to buy from a brand, download its products or subscribe to its service.